The ArduPilot Mega V2 now comes with a protective case included in the price! If you want to know more about the all new Ardupilot Mega V2 please click here. Some of the pictures shown are not accurate. 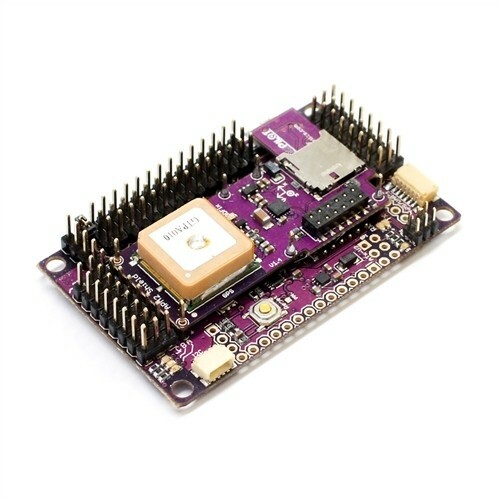 The new ArduPilot Mega V2 is the latest autopilot to come from the DIY Drones team; the ArduPilot Mega 2.0 has been developed over the past year to be smaller in both size and cost. This UAV autopilot can be used in both multi rotor heli's and fixed wing air frames. While the size & cost of this new unmanned tech UAV autopilot has become smaller the ArduPilot Mega V2 features have developed for improved performance, the new UAV autopilot has a new digital motion processor, the Invensense 6 DoF MPU-6000 and a new barometric pressure sensor, the MEAS MS5011 which has a resolution of 10cm to make the most of the Arduino open source code on which it runs, through the use of the internal sensor fusion capabilities on the invensense MPU-6000 more than half of the processing capacity on the Atmega 2560 can be made avalible for new advanced features to be run. 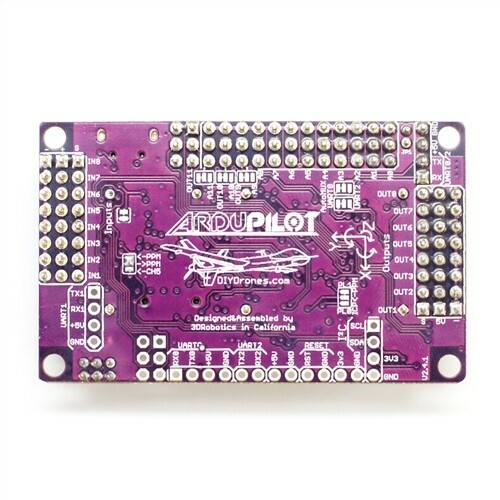 The footprint & profile of the ArduPilot Mega 2.0 has been reduced by the removal of the FTDI chip, there is an now an Atmega32-U2 serial programmer / PPM encoder in its place. The placement of all of the required components on one board with a micro daughter board mounted on top has a number of advantages, the first is the reducition in the size. However the most important is that the new board requires no soldering and is so much easier and quicker to install and operate. The daughter board houses the GPS sensor and a micro SD card, if you need to move the GPS to another location on your airframe you can use an external GPS unit and plug it in directly to the main board, no soldering needed and it’s “plug & play”. The new features are not limited to reductions in the size, cost and the addition of new processors and sensors, there are now 8 PWM outputs (and can be increased to 11 if you give up 3 of your 12 analogs) and 8 PWM inputs. There are now 12 analog pins that can be used as digital I/O pins and three of them can be “solder jumpered” to add extra PWM output channels (for gimbal operations). Each analog/digital pins can be used to read or control special devices like current, RPM, voltage and ultrasonic sensors and output devices like cameras and relay’s as needed. In the near future the mission planner will allow you to define which pins you have connected to a device and a drop box will give you the options to select pre-defined sensors or declare a new ones, this is not implemented yet but is planned in the future. Digital compass powered by Honeywell's HMC5883L-TR chip. Optional On-board GPS, Mediatek MT3329 module.